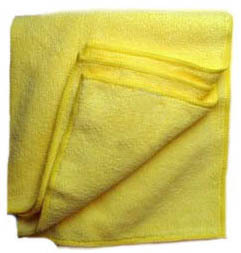 Micro-Fiber Polishing Cloth: Microfiber cloth is the newest in cleaning technology. These ultra soft microfiber towels will lift and trap dirt and moisture, leaving a clean, dry and polished surface without the use of harmful chemicals. A microfiber is an extremely small fiber no more than 100th the size of a human hair. There are approximately 90,000 microfibers in 1 square inch of fabric. These fibers are woven together and then split into wedge-shaped filaments. This drastically increases the cleaning surface area.